Please refer to our stock # 1-0757 when inquiring. 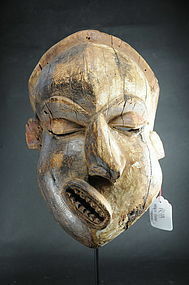 Rare "Mbangu" deformity mask, showing a distorted face. Wood, with traces of black and white pigments. Africa, Gabon, Pende Peoples. Height: 12" (30 cm). The mask is nicely mounted on a custom metal stand. Old accident restored locally, chips, age cracks, otherwise good condition. NOTE: Representations of distorted faces are rare in African art. They symbolize the effects of epileptic crisis, which are supposed to be a manifestation of the spirits. The use of black and white pigments enhances the distortion of the face.